You know the calorie count and the fat content. Shouldn’t you also know if your food contains GMOs? That’s the question on the table with H.R. 4432, a bill otherwise known as Deny Americans the Right to Know—or the DARK Act—which is set to be re-introduced to Congress this year. Regardless of what you think about the safety of GMO foods, this is a bill you need to know about. More than 90% of Americans believe that genetically engineered—also known as GMO or GE—foods should be labeled. Right now, it’s up to the states to mandate labeling. But GMO labeling is a headache for American corporations, and they’ve fought hard to avoid it. More than 70 labeling initiatives have been introduced in more than 30 states, yet only Connecticut, Maine and Vermont have successfully passed legislation. And here’s the kicker: The DARK Act would override state GMO labeling efforts and make voluntary labeling a Federal law. Do you think manufacturers will voluntarily label their foods as containing GMOs? I don’t. In fact, in the 64 countries where mandatory GMO labeling is in place, many companies reformulated their products to avoid having to comply with labeling. These types of changes just won’t happen if companies are allowed to choose whether or not to label. It’s the same situation with artificial food dyes and colors, which have different labeling requirements in Europe than the United States. That’s why our candies contain red dyes linked to behavior problems in children, while theirs are made with beet juice. But I digress. Before you make up your mind about the DARK Act, consider this: Genetically engineered ingredients begin as plants that have had their DNA changed in a laboratory. Most of these changes make the plants more tolerant to higher applications of pesticides, herbicides and insecticides. A report from the Organic Center found that farmers applied 318 million more pounds of pesticides over the first 13 years of commercial GMO crop production—from 1996 to 2008—than ever before. Why is this important? Pesticides have been linked to cancer, among other health problems. And children absorb far more of them than adults do. Let’s say you’re not worried about GMOs, pesticides and cancer. What about your right to know what’s in your food? That’s what’s really at stake here. So regardless of whether you’re pro or con on genetically engineered ingredients in your food, please help me take action. Send an email to your Senator, using the form at JustLabelIt. 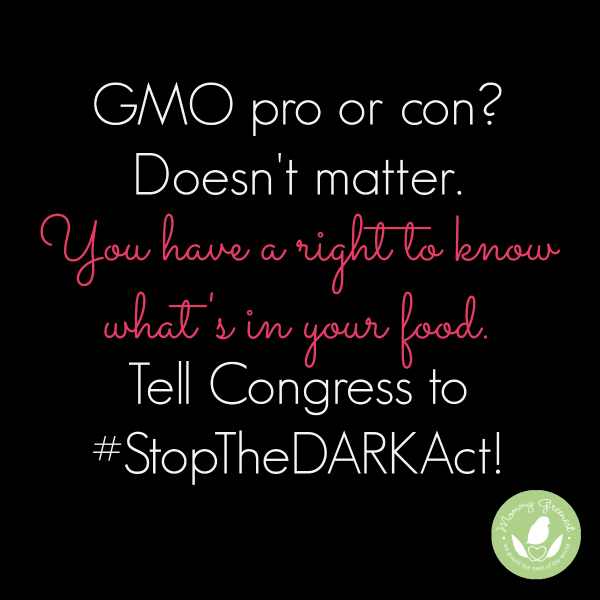 Call your Senator and ask him or her to oppose the DARK Act. JustLabelIt provides the name and number, or you can use WhoIsMyRepresentative. We have to stand up for our right to know what’s in our food. Do you agree? Did you sign and share? Please tell me why or why not, in comments below. Thanks! We have the right to know everything that is in our food. Transparency should be followed at all times unless there is something very serious you are hiding. I would say transparency should be followed ESPECIALLY if you’re hiding something serious. Like GMOs… Right?! ?